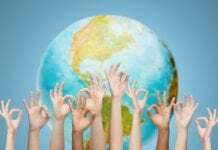 Home Uncategorized Articles What Are the Real Risks of Not Vaccinating in the U.S.? What Are the Real Risks of Not Vaccinating in the U.S.? 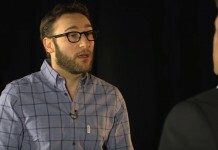 What Are the Current Risks of Infectious Disease in the US? We are repeatedly told by health officials and the media that those who do not vaccinate are reckless and irresponsible and that they are not only putting themselves, but everyone at risk. The question is, exactly what are the risks of choosing not to vaccinate? How bad are these diseases that vaccines are designed to prevent? Are unvaccinated children really that dangerous? Before we go any further, I would like to point out that most childhood infectious disease mortality rates were firmly in decline before most vaccines were even introduced. We even have documented cases that show that communities who stopped mandatory vaccines actually did better than those who didn’t. You can read more about this in part 8 in this series. In fact it turned out that sanitation and modernity had much more of an effect on the eradication of infectious diseases than vaccines ever did. I don’t want to minimize the threat of a massive outbreak of a truly deadly virus because there is that possibility, but at the same time, I think it’s important to put some of these more common childhood diseases in perspective. Back in the 60’s and 70’s most of these diseases were considered benign. What catastrophic event regarding infectious diseases has happened since then that has everyone so scared and turning against each other? We even have some people calling for the imprisonment of people who do not vaccinate. In 2015, when the Disneyland measles “outbreak” occurred, the media and health officials were quick to spread fear and point fingers at unvaccinated children for what turned out to be just over 150 cases nationwide. Really? 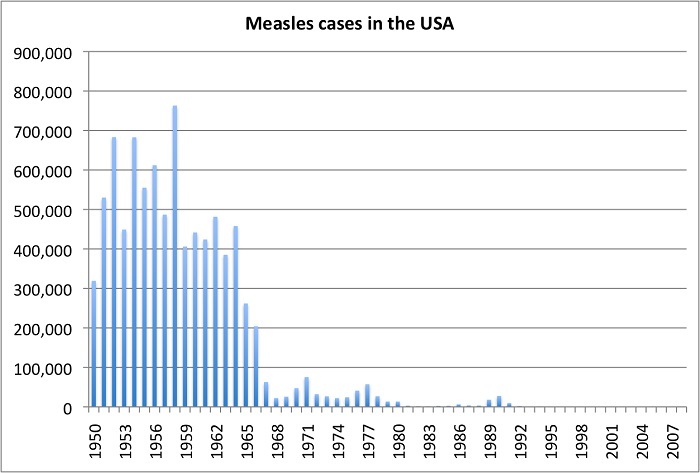 Just a few decades ago, we did not get hysterical about a few dozen or hundred measles, mumps, flu or chickenpox cases, even though we were historically closer in time to the last deadly outbreaks which occurred earlier in the twentieth century. We did not have parents turning on each other either. Before vaccines were even introduced, most childhood infectious disease mortality rates had dropped by over 95%. Our doctors knew that these diseases were benign and benefited children in many ways including their developing lifelong immunity to the disease. Yes, in some cases, these diseases can cause complications, particularly for people with weak immune systems and for those who live in less developed countries with sub-standard living conditions, poor sanitation and inadequate nutrition. In the U.S., however, common childhood illnesses result in a statistically small number of complications. In part 6 we will take a calm, rational look at the real risks of infectious diseases in the U.S. The seasonal influenza vaccine is one of the most widely distributed vaccines and it also has the most cases on record with the vaccine injury compensation program. The influenza vaccine is one of the only vaccines to still contain the controversial mercury-based thimerosal. You can get this vaccination from just about anywhere, including your local pharmacy and retail giant stores like Walmart. One of the things we know about the influenza virus is that there are so many different strains that scientists cannot always predict which strain might show up from year to year. Despite dire warnings and advice to get the flu shot, it turns out that even the scientists who develop the vaccine can’t vouch for its effectiveness. The swine flu scare of the late 70’s turned out to be based on four people with the illness. In fact, only one person died from the swine flu, while at least 25 died from the vaccine. The swine flu vaccine that was used was never tested before distribution and subsequently injured thousands. The recent flu scares turned out to be more hype too. Are we really that worried about the seasonal flu in regard to epidemics? I would certainly not want my loved ones damaged or killed by a deadly strain of the flu but at the same time, statistically, I am more worried about automobiles, cigarettes or even cheeseburgers when it comes to odds of death. The risk versus reward balance regarding the influenza vaccine is also something to seriously consider too, with effectiveness rates as low as 20% in some years, and others not effective at all. There are also many other examples of vaccines that did not perform that we cover extensively in part 5, 7, and 8 of this series. In a study published in the British Journal of Medicine, researchers found that influenza vaccines have had little or no effect on reducing the incidence of influenza. Now take a look at the actual risk of the flu. Seasonal flu deaths are much lower than most people may realize. The CDC once had influenza deaths listed at 36,000 (now at 3,000—49,000) per year but we are told those numbers are not accurate because the CDC skews the statistics by including pneumonia deaths in the numbers. The above chart is from an article titled “Flu Myths” that uses CDC data on actual Influenza deaths per year in the US, broken down into age groups. 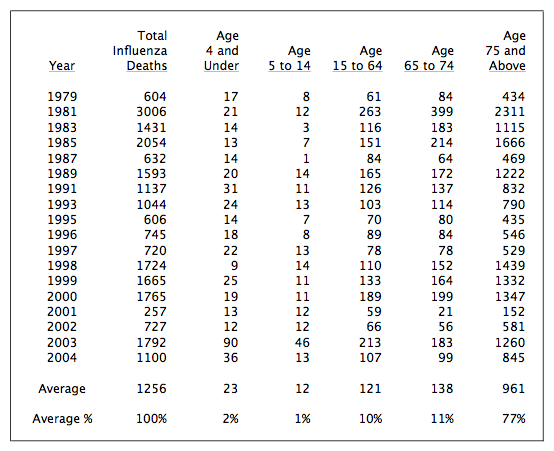 As you can see, the vast majority of influenza deaths (88%) occur in populations of 65 years and older. According to CDC records, 88% of influenza deaths occur in those over 65 years old. The influenza mortality rate for children under 15 years old on average is 3% of total deaths or less than 20 deaths per year. Why are we giving millions of infants, children and pregnant mothers mercury laden flu shots that have not been proven safe and effective ? Less than 20 deaths a year from the flu in the U.S. with children under 15 years old. This campaign for children to get their flu shots makes absolutely no sense at all, especially when you factor in the costs of administering all these vaccines, both in dollars and vaccine damaged children. It’s like we are trying to kill a mosquito with a shotgun. To put that in perspective, well over 100 times that number die every year by something as innocuous as water, mostly bathtubs and pools. We lose more children to television accidents (falls) than the flu. 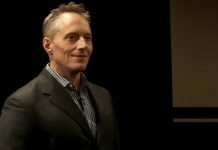 Dr. Mark Geier raised questions about the safety of vaccines and paid the price at the hands of the medical establishment. Although he has extensive experience as a doctor, scientist and geneticist, when he tried to make vaccines safer he was professionally attacked and subsequently lost his license to practice. One of the main concerns of Dr. Geier was the fact that mercury-based thimerosal was still in childhood vaccines, via the influenza vaccine. He also points out that the threat of the flu is highly exaggerated. 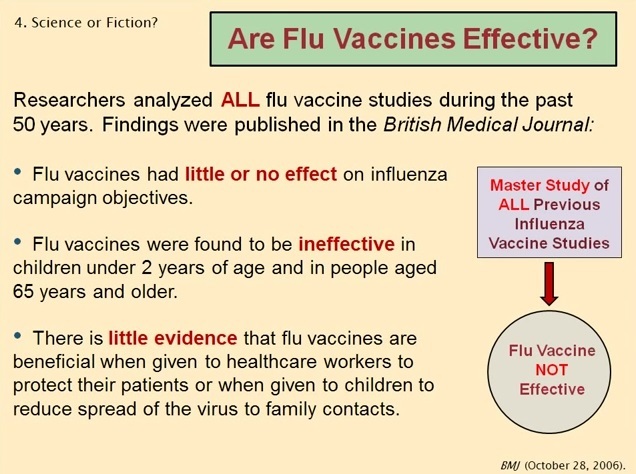 In the above video Dr. Geier talks about why the influenza vaccine is not effective and the fact that it is not tested for safety or efficacy. As you can see below, it is right on the package insert. In 2005, Peter Doshi wrote an article that was published in the British Medical Journal titled “Are US flu death figures more PR than science?” Doshi addresses the fact that CDC skews flu death statistics, making it appear that many thousands more Americans die from the flu each year than they do in reality. His message is clear: CDC flu death numbers simply don’t line up with national vital statistics numbers. What makes this problem even worse, according to Doshi, is the “… marketing of fear—a CDC communications strategy in which medical experts “predict dire outcomes” during flu seasons.” So the CDC dishes up a double whammy that drives up flu shot sales: inflated death statistics paired with scary predictions and urgent warnings to get the vaccine. To seal the deal, the flu shot is now widely available and you don’t need a doctor or a nurse to give it to you. Pharmacies around the country have boosted sales by offering walk-in flu shots and they’re free — your health insurance picks up the tab. Our media continue to report the inflated CDC numbers as if they are fact, with no attention given to the discrepancies. As Dr. Geier points out in the video above, about 300 million flu shots are given each year, versus 20 million childhood vaccines. Dr. Geier asks: “Which one do you think matters to them monetarily and power-wise?” Follow the money. We are led to believe that the measles is a very dangerous disease and, while that can be true in certain circumstances, for the average American, not so much. Measles complications arise most often among those with weakened immune systems and those living in less developed countries. 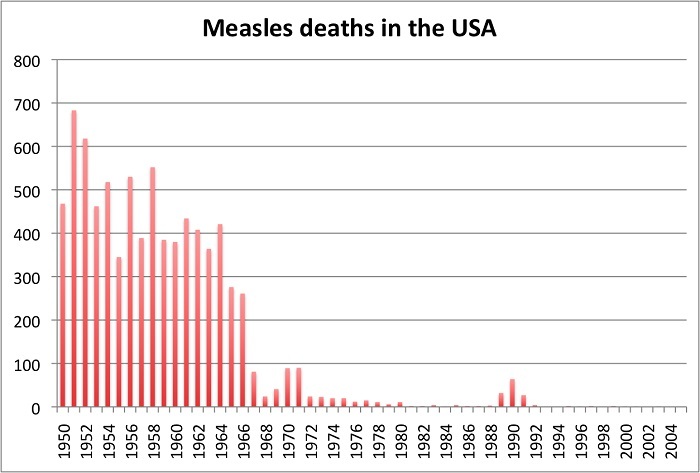 In the last 10 years more people died in the U.S. from the MMR vaccine than from measles. As we see in these charts, in a population of over 300 million people, there are a few hundred cases of measles each year and measles deaths are now a rare occurrence. 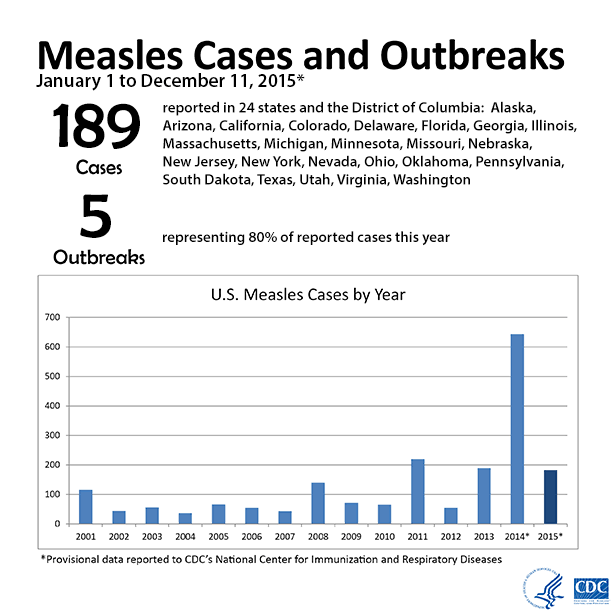 Measles is a primarily benign disease and recovery from measles may actually be beneficial to our immune systems. This doesn’t sound like something we should be overly concerned about. In 2015, the CDC recorded 189 cases of the measles that occurred within 5 different “outbreaks.” This doesn’t even move the needle as far as health related concerns go in this country, yet these are portrayed as dangerous outbreaks. In reality, they are statistically non-events. And now we come to the HPV vaccine. This is a relatively new vaccine whose marketing implies that it can prevent cervical cancer in women, even though there are no conclusive studies that prove this. There are scores of young girls who claim to have been seriously damaged by this vaccine and well over 100 deaths have been attributed to it so far. A New York Times article notes: “In the United States, cervical cancer mortality rates plunged by 74% from 1955 – 1992 thanks to increased screening and early detection with the Pap test.” As was the case with so many other diseases, the HPV vaccine was introduced as the problem it’s designed to solve was already being addressed very effectively. The CDC tells us that HPV is a very common virus and that most sexually active people will contract it at some point. They also note that condoms can prevent the spread of HPV. In the video below, Dr. Diane Harper explains that in about 90% of HPV cases, the body clears the virus on its own within 2 years. Dr. Diane Harper is a practicing OB/GYN and was one of Merck’s lead researchers who developed the Gardasil vaccine. According to Dr. Harper, the incidence of cancer resulting from HPV cases turns out to be a very small percentage of HPV cases. After hearing what Dr. Harper says about the low risk of getting invasive carcinoma from the HPV virus, let’s consider the VAERS data on Gardasil and ask ourselves if it is really worth the risk to use this vaccine. As we can see from the graphic above, the incidence of abnormal pap smears, cervical dysplasia (a precancerous condition) and diagnoses of cervical cancer increased over this period, following introduction of the HPV vaccine. An April, 2015 study found that “… vaccinated women had a higher prevalence of nonvaccine high-risk types than unvaccinated women.” Dr. Mercola tells us that these findings indicate that the HPV vaccine may actually make women more susceptible to more serious strains of the virus. He also notes that at present, cervical cancer is responsible for less than 1% of all cancer deaths in the US. 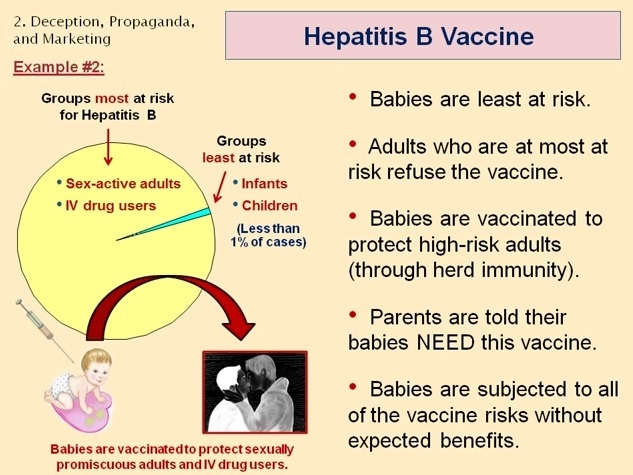 The Hepatitis B vaccine for infants is perhaps one the most questionable vaccines of all. Hepatitis B is contracted primarily in two ways: IV drug use and sexual transmission. Infants are simply not in that risk group. So why would we give newborn babies, only hours old, the Hep B vaccine? These vaccines will wear off before a child would ever even need it. 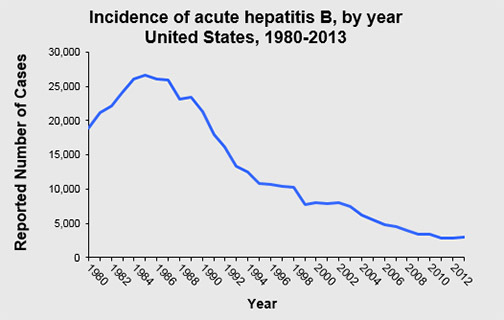 Even so, as you can see in the chart below, Hepatitis B is not some national scourge that requires us to vaccinate our babies. This makes no sense at all. Even polio, the infamous and highly feared ‘epidemic’ of the 1950’s, has very little effect on 95% of the population who contract it and only a minute percentage of the remaining 5% experience any long term symptoms. 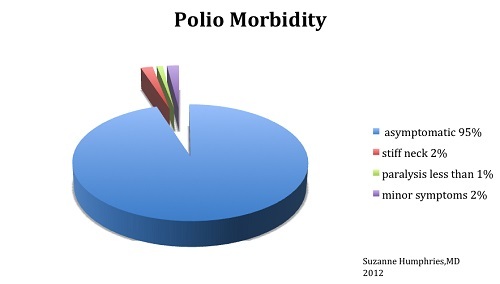 The vast majority of those who contract polio will have no symptoms. Maybe even more surprising is that synergistic factors have now been identified which account for the polio spikes we saw in the earlier part of the last century. We will cover this extensively in part 8 of this series. The polio virus normally lives in our guts. Most people will never know that they have polio because up to 95% of all polio infections have no symptoms. About 5% of polio infections are accompanied by some flu-like symptoms, such as an upper respiratory tract infection (sore throat and fever) and gastrointestinal disturbances (nausea, vomiting, abdominal pain, and diarrhea). In this small number of polio cases that have these symptoms, it is impossible to tell polio apart from many other types of viruses, and it typically results in complete recovery. Once you’ve had polio, you will be immune to it for the rest of your life. Less than 1% of all polio infections result in any kind of paralysis and the vast majority of those who have it will still make a complete recovery. The Mayo Clinic website affirms that “… the vast majority of people who are infected with the polio virus don’t become sick and are never aware they’ve been infected with polio.” The site explains that those with polio typically experience mild, flu-like symptoms which last 1-10 days. For a very thorough and supremely researched perspective on the actual dangers of polio and its supposed ‘eradication’ by the polio vaccine, you can watch Dr. Suzanne Humphries’ presentation at the Association of Natural Health Conference in 2013. Every death is significant and I do not want to minimize any of them, but as you can see on the chart below, chicken pox is not statistically very deadly. Even when chicken pox cases numbered in the hundreds of thousands in the U.S. there were still well under 200 deaths per year. This is hardly enough to warrant mass vaccinations and all the potential for adverse reactions that come with any vaccine. Most children who contract chicken pox fully recover, with the benefit of having developed lifelong immunity. Chicken pox tends to be more deadly if you get it as an adult, without having had it as a child. He explains that shingles can be prevented through contact with children who have had the virus, thereby stimulating the immune response in small doses and thus, beefing up the immune system to prevent a reactivation of the virus that results in shingles in adulthood. With fewer and fewer children contracting chicken pox, he explains, this opportunity for natural immunity boosting is becoming lost. 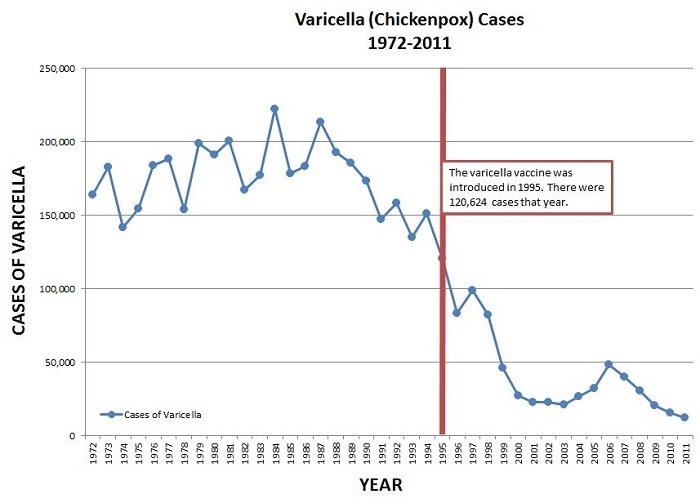 “Prior to the universal varicella vaccination program, 95% of adults experienced natural chickenpox (usually as school aged children)—these cases were usually benign and resulted in long term immunity. This high percentage of individuals having long term immunity has been compromised by mass vaccination of children which provides at best 70 to 90% immunity that is temporary and of unknown duration—shifting chickenpox to a more vulnerable adult population where chickenpox carries 20 times more risk of death and 15 times more risk of hospitalization compared to children. 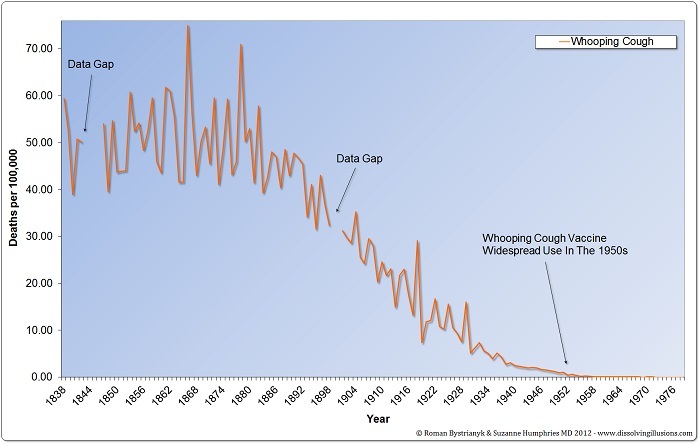 When we look at the historical trend in the first chart below, you notice that, like most infectious diseases in the 20th century, deaths due to pertussis (whooping cough) were rare after the 1950’s. By the 1960’s, you can see that pertussis had all but vanished in the U.S. 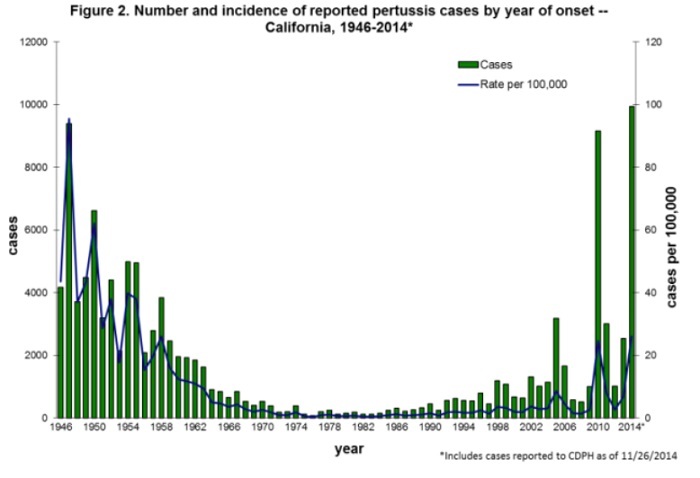 But something interesting has happened with pertussis in the last 10 years. Despite widespread vaccination for the disease, pertussis is popping up in pockets of fully vaccinated populations. 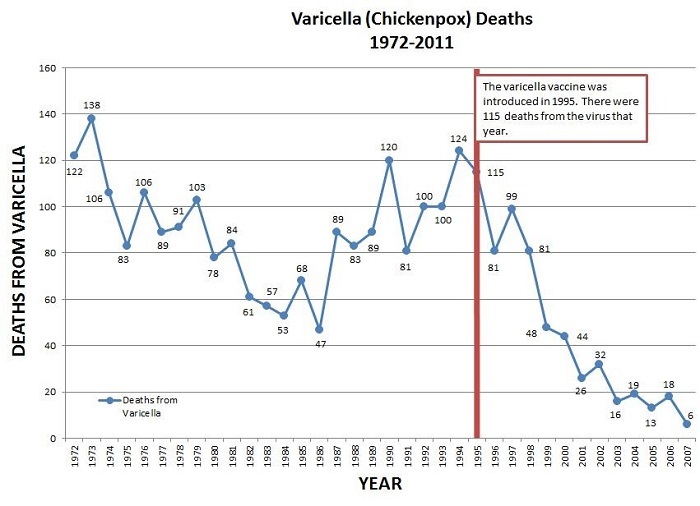 As we see here in the second chart, there has been a resurgence in pertussis cases despite widespread vaccination. 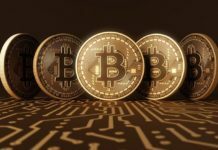 In a population of over 300 million people 2,000-3,000 cases per year is still a very small number to worry about, but if this is a trend it could be a problem. There is mounting evidence suggesting that pertussis may be mutating. This is not a new phenomenon. We have seen bacteria adapt to inhospitable environments and mutate, to create new and more virulent strains. This is just what has happened with various bacteria becoming resistant to the antibiotics that have been over-prescribed to treat them. Could This Aggressive Schedule Be Making Things Worse? One of the challenges we face in medicine today is the over prescription of antibiotics, which causes the mutation of bacteria, creating a new strain of the germ that is resistant to the drugs we have to treat it. In an article titled, “5 Frightening Consequences of Overusing Antibiotics” CDC Director Tom Frieden warns us of “nightmare bacteria” which have evolved against modern antibiotics. He tells us that this can lead to strains that are more dangerous. Could we be doing the same thing with vaccines? 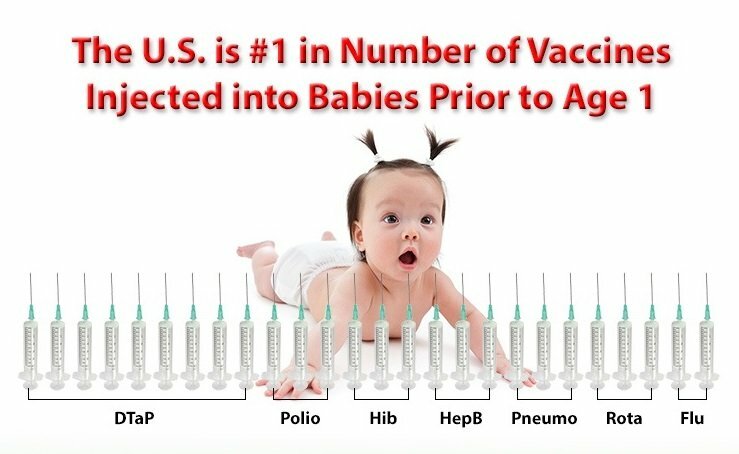 As we saw in part 5 of this article, vaccine effectiveness is anything but consistent and the fact that we are seeing so many cases in fully vaccinated populations means that we must ask ourselves what is the true worth of vaccines, especially when all the side effects are factored into the equation. 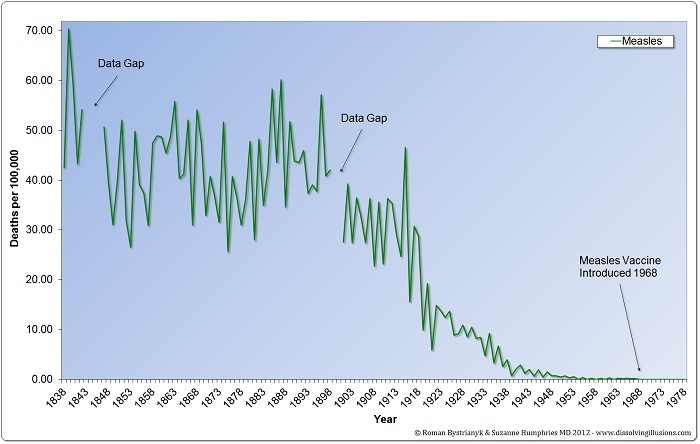 There is evidence that whooping cough is evolving and becoming resistant to current vaccines. What if we are actually making things worse with so many vaccinations? What if we are actually promoting the development of a deadlier next generation of diseases with so many vaccinations? What if infectious diseases serve to strengthen our immune systems but, by circumventing the natural process, we are doing more harm than good? Unfortunately, our health officials think vaccines are the hammer and every disease is a nail. They are really not interested in looking at vaccines as a possible cause for so many other ailments which are becoming more prevalent. Are We Trading True Health for the Perception of Health? Here is a question I think we should ask ourselves. Are we trading real health for the perception of health? What I mean by that is, despite implementing a broad and aggressive vaccine schedule over the last two decades, the health of our population has seriously declined in some significant ways. Over the past 50 years, we have witnessed a drastic uptick in the incidence of neuro-developmental disorders like autism, autism spectrum disorders, ADD and ADHD. As you can see in part 9 of this series, there is empirical evidence linking vaccines to autism and health officials know it. We have also seen a huge surge in autoimmune disorders like Lupus, MS, Crohn’s Disease, Celiac Disease, Fibromyalgia, Asthma, Rheumatoid Arthritis and many new allergies. In most cases we simply do not have the data to link vaccines or specific vaccine ingredients to this phenomena, but in the absence of data, is it prudent to continue with such an aggressive vaccine agenda? Giving vaccines the benefit of the doubt for a moment, even if some vaccines have helped to eradicate some diseases (which is arguable), it is impossible to know if the benefits outweigh the risks without solid research. This is especially true now that we understand that childhood illnesses we vaccinate for do not typically result in the dire outcomes we’ve been led to believe. Vaccines bypass the natural immune defense system. There are many doctors who tell us that this can be a problem. The natural way for us to be exposed to a virus, for example, is via our nasal cavity or throat. Vaccines, on the other hand, penetrate our first line of natural defense: our skin. They introduce foreign matter directly into our blood systems and bypass the natural immune functions of our skin, tonsils and mucous membranes. By attempting to circumvent natural infectious disease contraction by injecting the viruses into our muscles, we are disrupting the natural order of things and preventing our immune systems from exercising the full array of defenses our bodies possess. What kinds of short-term and long-term consequences occur as a result? As we illustrated in part 5 of this article, vaccines carry their own set of risks which are sometimes much worse than the disease itself, especially in developing countries where complication risks are much higher. Even the CDC has acknowledged that chronic disease is the larger issue we face. Unfortunately, they seem to want to fix it with more vaccines. The CDC published a peer reviewed paper in 2012 titled In Search of a Germ Theory Equivalent for Chronic Disease, in which author Garry Egger, PhD, MPH, reflects on the fact that we have experienced a shift in predominant illness from infectious diseases to chronic disease over the past decade or more. Dr. Egger notes a need to identify a theory for chronic disease, particularly the epidemic of metaflammation. Metaflammation is low-grade, chronic inflammation that is prevalent in those with diabetes and obesity. Some other associated conditions, according the author, are depression, cancer, dementia and heart disease. Among possible causes of metaflammation, the author lists environmental anthropogens — things that induce metaflammation and result in various chronic diseases. The author notes the significant rise in these conditions beginning in the early 1900’s, with the advent of the industrial revolution. Some potential anthropogens, the author suggests, are smoking, air pollution, sleep deprivation, stress, ratio of omega 6 to omega 3 fats and fast food, among a few others. Buried in this list of potential causes of chronic disease, Dr. Egger includes EDCs, which are endocrine disrupting compounds. EDCs are chemicals that mimic, block or otherwise interfere with the body’s hormones. Aluminum and mercury are known EDCs and they are both found in our vaccines. For the astute reader, this article incites a number of questions regarding the CDC’s willingness to publish an article that points out, (albeit in small print, in the form of an acronym on a graph), the potential damage caused by the vaccine products they so adamantly promote. How could the author and the CDC fail to notice the correlation between vaccines and the rise of metaflammation? How did they miss mentioning the fact that aluminum is found in abundance in vaccines? Or that the flu shot is full of mercury, in the form of thimerosal, which is a well-known EDC? How do they avoid drawing the connection? You can read more about the topic of EDCs in vaccines in this 2009 article from Huffpost Healthy Living, by Deirdre Imus. 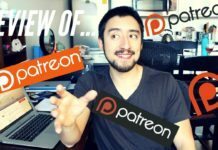 In article after article, you will find the dangers of EDCs highlighted but the sources are always listed as environmental, food and consumer products. It is interesting that the only EDCs injected directly into the bloodstream are vaccines but, somehow, they are never mentioned. They have simply been banned, it appears, by the powers that be, from the talking points on the topic of EDCs. The very organization which sponsors our early and robust vaccine schedule, beginning at 2 months of age, is publishing a paper that acknowledges the inherent danger of vaccine ingredients. Dr. Egger postulates that vaccine adjuvants are anthropogens, responsible for the rise of the costliest and deadliest afflictions we face today: cancer, obesity and heart disease. You didn’t miss this in the news. It never made the news. One can only imagine the CDC’s choice to publish such an article. The lead was buried, to be sure, but has no one really made the connection? Unlikely. More likely is that CDC is laying the groundwork for tomorrow’s vaccines for obesity, cancer and diabetes. Perhaps some new vaccines to treat the damage done by the old vaccines. What Effect Do Multiple Vaccines Have on Immature Immune Systems? 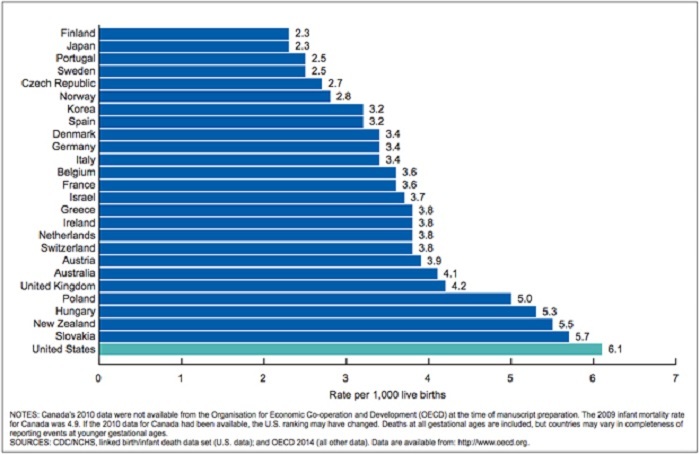 We have vaccinated more children with more vaccines than ever in the history of our nation, yet the US falls behind most developed countries in overall health. Is the overarching goal really to improve our health or is it to increase the number of people who rely on pharmaceutical products and to increase the number of products they need? These two purposes present a glaring dichotomy that will never be squared. When a baby is born in the U.S., he or she is vaccinated with a Hepatitis B vaccine within the first 24 hours of birth. Most newborns are given a vitamin K shot as well. The reason for the vitamin K shot is because mothers usually become deficient in vitamin K in the last trimester. We know that newborns have very immature or underdeveloped immune systems. This is why new mothers are advised to go straight home after being discharged from the hospital and to keep their newborn in the house for the first 4-6 weeks. The hepatitis B Shot contains multiple ingredients in addition to the virus itself, including aluminum and formaldehyde, and is injected into babies when they’re only hours old. The vitamin K shot is a synthetic form of vitamin, and in some cases there is aluminum in this shot as well. There are also 9 milligrams of benzyl alcohol in the vitamin K shot that is said to be absorbed by the baby’s liver. Some doctors say the benzyl alcohol is the cause for jaundice diagnosed in many babies soon after birth. During the well baby doctor visits that occur over the next 24 months, babies’ immune systems are bombarded with a battery of 18 different vaccines, with as many as 10-13 in one visit. There is no rationale to justify giving anyone, let alone infants with developing immune systems, this many injections at one time. 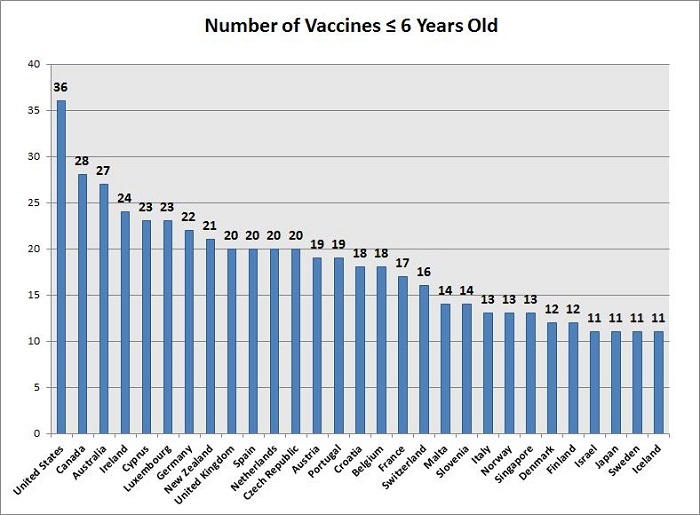 The charts below demonstrate that children in the US receive more vaccines before they are 6 years old than children in any of the other 29 developed nations listed, while also having the highest infant mortality rate of the 26 countries listed. 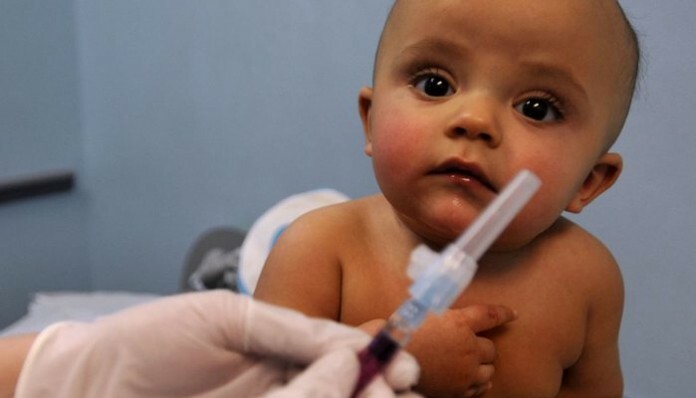 Neil Z. Miller and Gary S. Goldman published a study in 2011 highlighting the statistically significant correlation between number of vaccines given to infants in a specific country and that country’s infant mortality rate. It is a linear correlation, across the board, which means that as number of doses increase, infant mortality increases. This study suggests that vaccines may be the actual cause of death for some portion of infant deaths attributed to other causes, including SIDS. Why Not Compare Vaccinated to Unvaccinated? Vaccines have been around for many decades yet we still have not compared vaccinated versus unvaccinated. We are told by our health officials that it would be unethical to do a test like that because they do not want anyone going without vaccines. They make this peculiar issue the one untouchable thing they could never do, from an ethical standpoint. This really makes no sense at all, though. We have thousands, if not millions, of people who have not vaccinated or do not vaccinate for religious, philosophical or other reasons who could participate in these studies. Why have we not done this already? This is really basic science 101. If you have a product, any product, and you want to truly learn how safe and effective it is, you have to compare outcomes in those who receive it to at least some people who do not receive it. That’s the whole premise of approving a drug, right? The idea would be that receiving a particular vaccine would be better than not receiving it. What are we afraid of finding? Does anyone else find this strange? Could it be that an industry with so much invested in vaccines, would never risk doing a study that could possibly undermine sales? Or worse yet, could it be that the results of a single study of this type would stand to hurt the sales of all vaccines? Maybe the most damaging of all potential outcomes would be that the safe and effective message that has been so carefully developed and promulgated by drug makers would fall apart and, with it, the confidence of the people in vaccines all together? 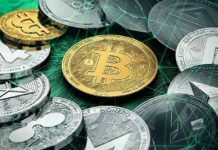 The pharmaceutical industry will not allow this type of research to be done if they can help it and if it is done, they will likely ensure that it is never published, because even one study of this type could reveal data that would be their ultimate undoing. Because we have no research of this type, we need to turn to less formal data in the form of a survey (which may be a good thing, considering the issues that abound with clinical trials lately) to search for clues about the difference between those who are vaccinated, versus those who are unvaccinated. 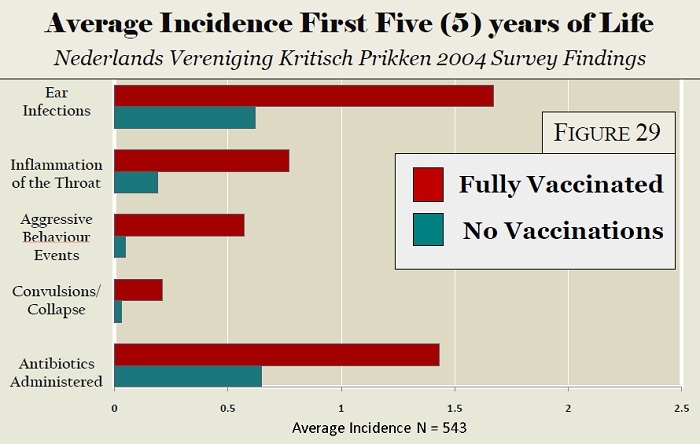 In 2004, NVKP, an association comprised of doctors, therapists, parents and others, conducted a survey in The Netherlands that compares the incidence of numerous symptoms and illnesses among vaccinated vs. unvaccinated people. This chart only lists a few of the maladies but the study itself contains much more information, which you can read for yourself. 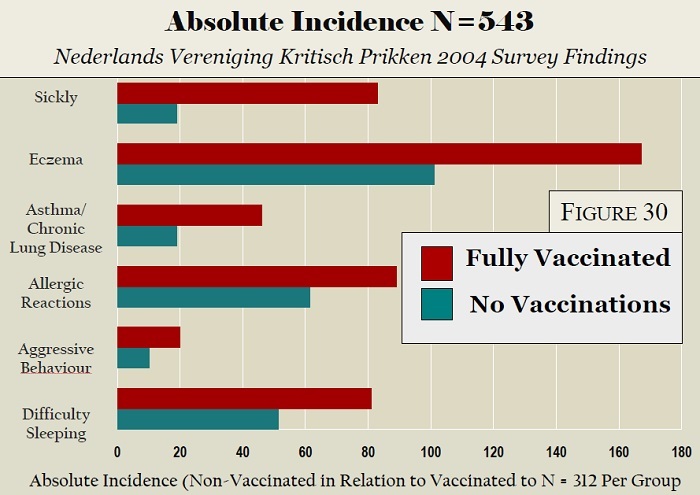 The red bars represent the vaccinated and blue bars represent the unvaccinated. 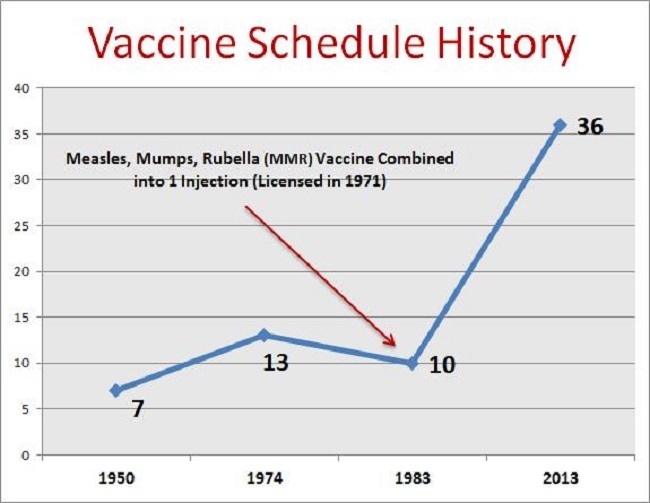 Why Has the Vaccine Schedule Increased So Dramatically? What has happened in the last 30 years that has made us so afraid of these diseases in the US? 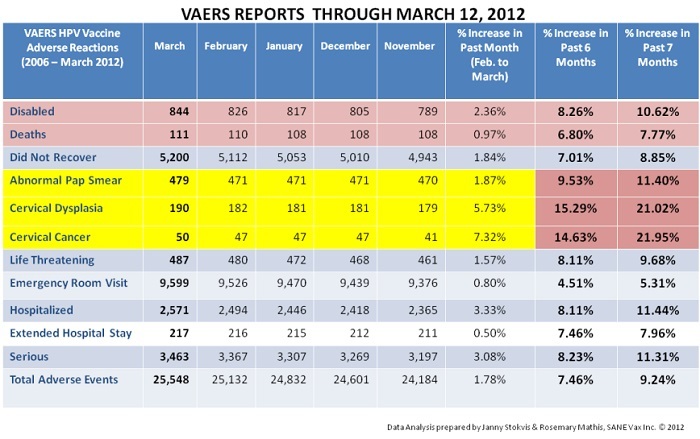 Why has the vaccine schedule increased so dramatically? The only significant event in the last 30 years that we could find through our research was the passing of the National Childhood Vaccine Injury Act in 1986. This made way for the Vaccine Injury Compensation Program (VICP) which completely absolves pharmaceutical companies from any legal liability whatsoever for the safety of their vaccines and shifts the burden of responsibility of compensation payments to the American taxpayers. Is this legal immunity the catalyst that enabled the ever-expanding vaccine schedule we’re witnessing? We could not find any significant event in the U.S. that would call for such a dramatic increase in the vaccine schedule. As any investigative reporter will tell you, to get to the bottom of any complex story you must follow the money. As you can see from the chart below, there is a substantial monetary gain for the drug makers to increase vaccination rates. 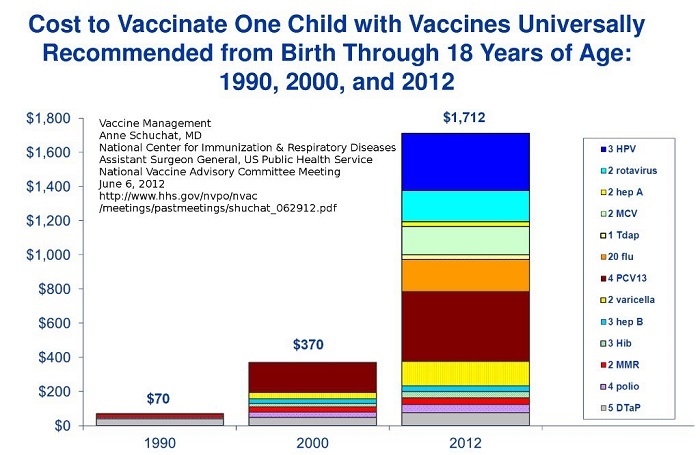 In fact, just from 1990, the costs of vaccinating children from birth to 18 years of age has increased over 2500%, and they are lobbying for more. Is this the reason that billions of dollars are allocated to lobbying our elected officials every year? Why does the pharmaceutical industry spend almost 3 times the amount lobbying legislators as the next closest industry? What are they getting in return for all that money? As we can see in the statistics above, infectious diseases in the US has not morphed into some new national threat over the last 30 or 40 years. There are no new developments in public health which warrant the extremely aggressive and expensive vaccine schedule that is now in place in the US. The illnesses for which we vaccinate do not typically result in the horrific outcomes we’ve been told. In fact, third world statistics are very often used to scare people into vaccinations. When terrible outcomes are associated with a particular illness, they are sometimes fewer in number and less harmful than those associated with the vaccine for that particular illness. Why have our health officials taken such extreme measures? They would tell us that that they are singularly concerned with children’s health. All we have to do to see the folly of such a statement is to note the absence of research showing that receiving any particular vaccine is better for us than not receiving it. If you care about child health, you study products rigorously. If you care, you make sure that your product is safe in the short-term, in the long-term and in combination with your other products. If you are concerned with children’s well-being, you make sure that your product doesn’t inadvertently cause more problems that it solves. Keep in mind, drug makers have over 250 additional vaccines in development which they will roll out as soon as possible. It seems that the ultimate goal is to vaccinate our whole population of 300 million + and to do so in the absence of informed consent and without exemption. Does this make any sense? It only makes sense when you look at the growth strategy of the pharmaceutical industry.